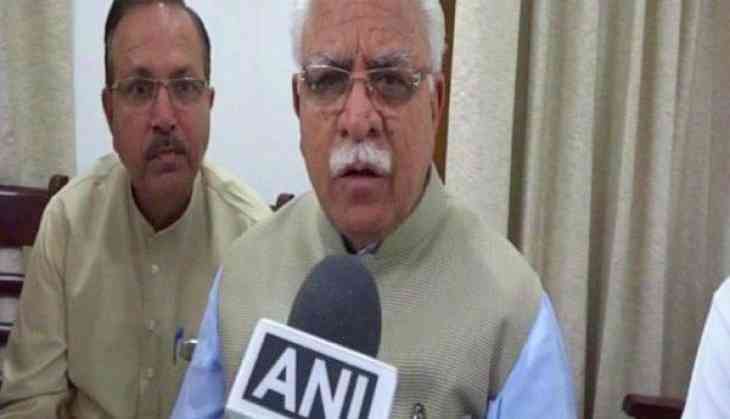 Raising the burning issue of the SYL ( Satluj Yamuna Link) canal, Haryana Chief Minister Manohar Lal Khattar on 19 May, asserted that petition has already been filed and expressed hope for better results from Supreme Court. "The SYL issue is a prolonged one that will soon be resolved. The petition has already been filed and we hope for better results. Southern Haryana had been facing drinking water issues from the past 12 years but not anymore," Khattar told ANI. Khattar further assured that the districts that were facing water issues in the Southern Haryana region are soon to get resolved. "We have filed our petition to the Supreme Court and the result would be out soon. Districts that were facing water issues will soon come over it. The matter has been pending before the bench since November last. There are already two decrees of the court and we are anxiously waiting for these to be executed by the plaintiff (Punjab)," said Khattar. Earlier this month, the Apex court had heard the Sutlej Yamuna Link (SYL) Canal matter. The final hearing was put off after the Centre informed the court that a meeting of Punjab and Haryana has been convened by it on April 20 to resolve the matter. The court, however, made it clear that if a solution was not found, it would proceed with the matter on the next date of hearing. The bench, also comprising of Justice Amitava Roy, considered the statement of Solicitor General, Ranjeet Kumar and deferred the hearing in the case. The apex court refused to hear the Punjab Government's plea to adjourn the SYL Canal matter till the election results were announced and posted the matter for further hearing till February 22. Senior lawyer Ram Jethmalani, appearing for the Punjab government, sought an adjournment which the top court refused. A bench headed by Justice Pinaki Chandra Ghosh refused the plea and asked, "What has the Supreme Court to do with the election results?" In January, the apex court asked both the Haryana and Punjab Governments to file their replies on the issue within three weeks. The Punjab Government had earlier sought more time from the court to file a detailed reply on the same. A bench of the court headed by Justice Ghosh and Justice Amitava Roy granted the decision. The apex court had, in November last year, termed the law passed by the Punjab Government in 2004 to terminate the SYL Canal water sharing agreement with neighbouring states as 'unconstitutional'. Holding that the Punjab Termination of Agreement Act, 2004 was not being in conformity with the provisions of the Constitution, the top court answered in the negative to all four questions referred to it in a presidential reference. A constitution bench of the court ruled that Punjab could not and should not have taken a 'unilateral' decision to terminate the agreement with Haryana, Himachal Pradesh, Rajasthan, Jammu and Kashmir, Delhi and Chandigarh to share the Ravi-Beas river waters. The court ruling was also followed by resignations of Punjab Pradesh Congress Committee president Captain Amarinder Singh and state Congress MLAs.